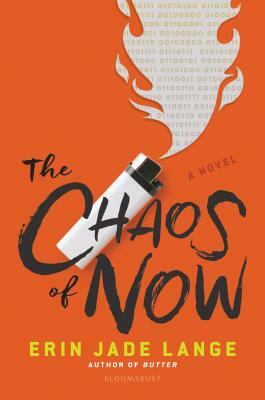 The Chaos of Now is an intriguing story about a boy named Eli who, while in high school, gets a mysterious invitation to join a team for a hacking competition because the team's other member had committed suicide the year before. Eli, while in trying to get out of it, realizes that he’s in too deep when he discovers a conspiracy about Jordan -- the team's deceased member. I enjoyed this book a lot, it had plot twists, family drama, and the added element of romance. The book was unlike anything I had read before and had a satisfying ending that closes the story nicely. Take it from a person who rarely. if not ever, reads books about coding, or with a male protagonist: This book will change your life. In The Chaos of Now, Erin Jade Lange strikes the problem of cyber-bullying will full force, and stresses the pain that victims feel, and even more, the effect on the bullies. I can't love this book any more. Erin Jade Lange writes facts by day and fiction by night. As a journalist, she is inspired by current events and real-world issues and uses her writing to explore how those issues impact teenagers. She is an only child, which means she spent a lot of time entertaining herself as a kid. This required her to rely heavily on her own imagination, which is probably why she became a writer. Erin lives in Phoenix, Arizona. Butter is her debut novel.